Living on a lake presents a homeowner with a boatload of interior design styles to run with, but this lakeside gem melds its own eclectic look for a style unique to its owners. KBN Interiors worked with Jim Phelps Collection to create this Shingle style home inspired by the classic lifestyle of Nantucket. From the muntins and the mullions to the elegant millwork, the interior architecture of this home is professionally finished for a look all its own—in fact, it even nabbed the prestigious "Best of The Lake Award" at North Carolina's Best of The Lake Design Competition. One step inside, and it's no wonder why this award-winning home is worthy of such acclaim. From the river rock fireplace to the Calcutta marble shower, the detail in this home is that of the highest standard. 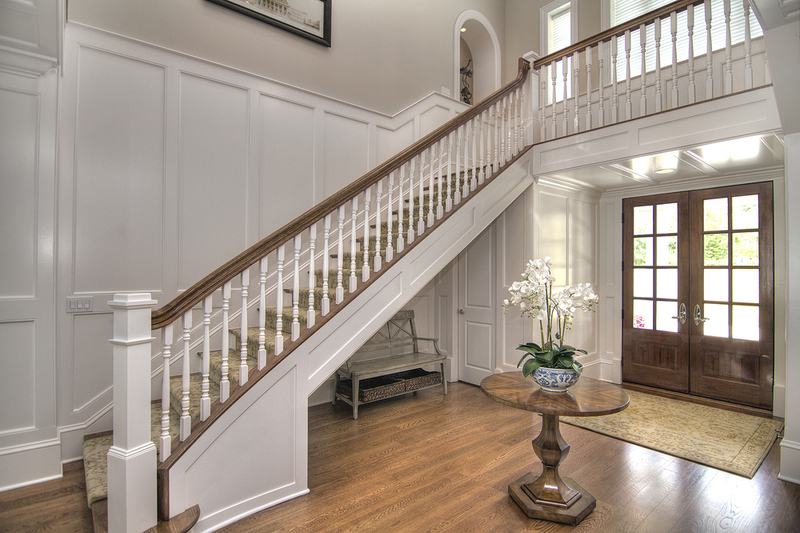 Custom millwork and paneling, as seen throughout the home, is designed by KBN Interiors to fulfill the homeowners' dream. A crown jewel of this customized package is the fully paneled Study with built-in bookcases—a room fit for a king! Down the hall the Great Room features french doors that open onto a patio that overlooks beautiful Lake Norman. Also overlooking Lake Norman are a stunning sunroom and two nooks designed to feel like enclosed porches—the perfect places to cozy up with a cup of coffee or tea. For formal dining, a stunning Marge Carson table in the dining room sets the mood while the nearby built-in wine bar offers ample storage—making entertaining guests easy and fun! A walk up the stairs completes a full square, and the custom selected rug, as well as the curated art selection enhances the experience. Upstairs the master bathroom is designed for pure luxury. The free standing soaking bathtub and Calcutta marble shower make bathing a divine experience. Custom built-in cabinetry provides ample amounts of storage space while the starburst mirror adds an incandescent touch to the overall interior design. This Lakeside Villa has a welcoming charm that recalls traditional New England style. The captivating interiors made possible by KBN Interiors and Jim Phelps Collection will help to shape a family legacy.